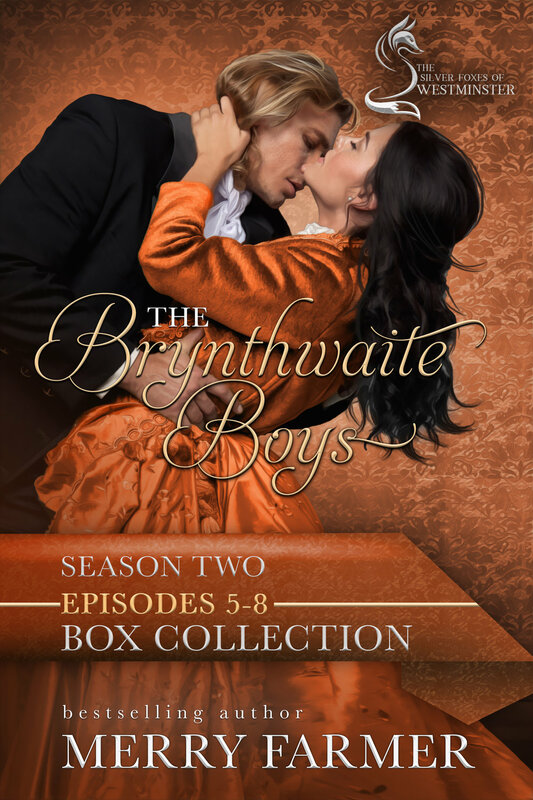 In the tradition of the costume dramas serials that captivate millions comes this episodic story of the lives and loves of three friends in Victorian England. Brynthwaite, Cumbria – 1895. Three men who were raised as close as brothers at the Brynthwaite Municipal Orphanage have returned home after making names for themselves in the world. After leaving Brynthwaite 15 years earlier, Jason Throckmorton has clawed his way to the top of the business world, making a name for himself as a hotelier. Now he is building a luxury hotel in Brynthwaite to draw wealthy tourists to the Lake District. But his real designs are on Lady Elizabeth, the woman he has obsessed about since he was a boy. Jason has a dark secret, though. But help comes in the form of the clever and insightful Flossie Stowe, a maid Jason hires to work in his hotel—a woman who harbors secrets of her own. Dr. Marshall Pycroft left Brynthwaite to become a doctor, making a name for himself in London. When Brynthwaite Municipal Orphanage was converted into Brynthwaite Hospital, he returned home to head it, taking his London wife and three daughters with him. Marshall has his hands full between the understaffed, under-funded hospital and his shrewish, overbearing wife. Until Dr. Alexandra Dyson, a lady in her own right as well as a qualified doctor, ask to work with him. But Alexandra’s mother has other plans for her disobedient doctor—plans that could land the hospital in hot water. Lawrence Smith never truly left Brynthwaite. As the local blacksmith, he plays a pivotal role in town, but as a well-known hedonist and reputed practitioner of old, pagan ways, he is both a subject of fascination and speculation. When a mysterious woman arrives on his doorstep with no memory, speculation runs rampant. How long will it take before her past catches up to her and puts Lawrence in danger? Still without her memory, Matty begins to adjust to Lawrence and the forge. Though haunted bits of her past assail her, she feels safe…but for how long? Alexandra has at last found a way to be happy in her new home in Brynthwaite. She and Marshall get along perfectly as colleagues at the hospital. But all that is threatened when Lady Charlotte suspects that Alex has deceived her. Meanwhile, Marshall has family problems of his own…problems that throw his entire family into chaos. At the hotel, Jason is beside himself as one thing after another goes wrong, and all when Lady Elizabeth is only minutes away from paying him a visit. Flossie is quick to find solutions to each problem the hotel faces, but in doing so, she creates a problem that Jason might not be able to fix. PLEASE BE ADVISED: Some steamy content, but mostly what would be considered “sophisticated situations” (as my mom used to say). Matty’s trial takes place, but when the surprise witness appears, pandemonium breaks loose. Will Matty be found innocent? At Lady Charlotte’s wedding, Alexandra is ready to resign herself to her fate, when Marshall proposes a plan that could save both of them. Will she say yes? The Dragon’s Head Hotel prepares to be turned upside down and put back together again in its new order as Jason and Flossie contemplate changing their lives. Will they take Lady Elizabeth up on her offer? Jason and Flossie attempt to navigate their deal with the Devil…also known as Lady Elizabeth Dyson, who proves to be more of a challenge than they expected. Lawrence has his hands full as Matty’s troubled siblings turn his life upside down. Marshall gets what he’s wanted all along, but will he and Alexandra have second thoughts? Marshall and Alexandra attempt to navigate their new life, but is their unfortunate patient, Winnie, as innocent as she seems? A chance encounter with a band of Romani leaves Lawrence questioning everything he knows about his past…and could give him the answers he’s always craved. Lady E continues her shenanigans, but will her demands drive Jason back to his old ways, or can Flossie redeem him before it’s too late? Jason and Flossie are overjoyed when they receive the good news they’ve been hoping for, but how will Lady E feel about it? How will Alexandra cope when she receives the same news, and will it destroy her relationship with Marshall? Lawrence’s anxiety about money take a backseat as news of a murder reaches him and Matty. The Christmas season brings more worry than joy as Marshall and Jason prepare to depart for London. Flossie receives a letter that may mean more trouble in the New Year. Alexandra too receives a letter that could change everything, including her heart. Matty and Lawrence discover, to their horror, that they aren’t as safe from the past as they hoped they were. PLEASE BE ADVISED: Some episodes contain steamy, steamy content! With Marshall and Jason in London, Flossie and Alex are faced with hosting a charity event alone, and the results are not what they expected. Matty makes a discovery that sheds a whole new light on Mother Grace and who she might really be. Things go well for Marshall in London, but Jason’s old demons attack him with devastating results. Marshall returns home, but his failure to reveal a key piece of information causes conflict in his household. At the same time, absence has made the heart grow fonder. Lawrence is handed an amazing new opportunity…just as an old foe makes his intentions known. Alex reaches a level of satisfaction with her new situation. And Flossie rushes to London to rescue Jason from himself. Jason deals with the consequences of his breakdown, particularly when it comes to facing Lady E and the future of their agreement. Flossie has a hard time taking it easy. Marshall takes action to end a dangerous situation with Winnie. Alex sees a patient that helps to drive home how blessed her life really is. Lawrence hears bad news from new friend, but it is Matty’s life that might be in danger. Everyone combines forces to save Matty, but her life isn’t the only one in danger. Marshall and Alex fight to save Winnie’s life, which gives Alex’s mother a glimpse into her daughter’s choices. Flossie’s problems with her sister have only just begun. And lives will be changed forever after a death nobody foresaw. As Jason and Flossie grow ever closer to the ridiculous wedding, they each form a new alliance that could change their futures. Alex finds her duties at the hospital harder to carry out, even as she finds she can rely on Lady Arabella. A surprise gift arrives at the Pycroft house just as Marshall makes a discovery about his past. Lawrence and Matty adjust to their new life post-Hoag…until a gruesome find in the lake. Marshall confronts his origins, Arabella comes out of hiding, and Lady Charlotte’s true involvement in the lives of the Brynthwaite folk all come to light just as a Scotland Yard inspector arrives in town, tipping everyone’s lives into confusion. Lawrence contemplates leaving Brynthwaite as the wives of the Silver Foxes of Westminster arrive at Jason’s hotel for an event. Lawrence and Matty prepare to leave, but Mayor Crimpley has other plans. George Fretwell returns to town, demanding Arabella come back to him. Marshall contemplates drawing a line in the sand that would affect his entire family. Flossie has it out with Lady E on the day before the wedding as Jason receives an offer he might not be able to refuse. The day of the wedding arrives and Lady E tries to keep Flossie away. Flossie and Alex both go into labor. Lawrence takes desperate action to help a friend. The wedding doesn’t go as expected when a startling revelation is made, and everything comes to a head in a climactic finale.